mouthwatering sweetness balanced with light acidity. It is everything a Southern lady loves. From Wes Byas of McGregor, Texas on 5/1/2018 . 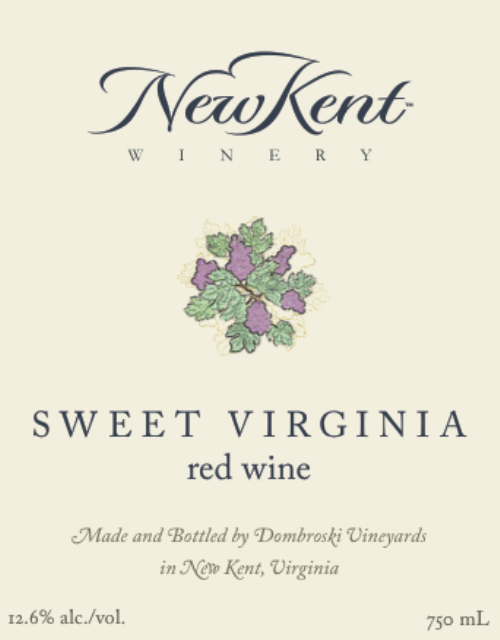 My wife and visited New Kent Winery last year while attending a conference in Williamsburg. We tasted several wines and walked away with the tasted of Sweet Virginia still on our tongues. For me, it is the absolute best wine I have ever had and that is saying a great deal since I have been fortunate enough to travel the world and sample an untold number of wines. From Thomas Bazemore of Norfolk, Virginia on 2/3/2018 . From Anonymous of Baltimore, Maryland on 10/8/2017 . Not a wine person, but tried this wine on a visit to Virginia. Had to buy it. It is the only wine I have found that I like. By Far My Favorite Wine Ever!! From Lisa of Chesterfield, Virginia on 7/17/2017 . I first sampled the swine after running a 5k at New Kent Winery. It was absolutely amazing. I have come back several times to purchase bottles to bring home. Everyone I serve this too absolutely loves it. From Anonymous of Copenhagen, New York on 3/14/2016 . Tried this recently while on vacation in VA. Delicious! It was sweet and smooth and I was wishing for more! I looked in Total Wine and at the grocery stores but couldn't find it. Guessing maybe it's only available at the winery? Bad choice because I planned to buy more but didn't have time to go to the actual winery. Anyway, I highly recommend this wine and hope to be able to purchase some on my next visit to VA.